The Haunted Hathaways debuts tonight on Nickelodeon at 8:30 p.m. Eastern. The Haunted Hathaways has a unique, slightly convoluted premise: A single mother and her two daughters relocate to New Orleans, only to find that their house is haunted by three friendly ghosts—a single father and his two sons. Exactly how they became ghosts, the nature of their incorporeality, and how long they’ve been playing the saxophone and haunting the denizens of their house, is not an essential part of the story—instead, The Haunted Hathaways focuses on the ghost-kids and real-kids conquering the trials of teenage life together. For Taylor and Frankie, this means making friends and finding a place in their new hometown. For the ghosts, Miles and Louie, this primarily involves learning how to scare people the way grown-up ghosts do, perhaps while alleviating perfectly natural feelings of loneliness—after all, most people can’t see them. It's a wacky, blended, supernatural family, debuting tonight on a television near you. 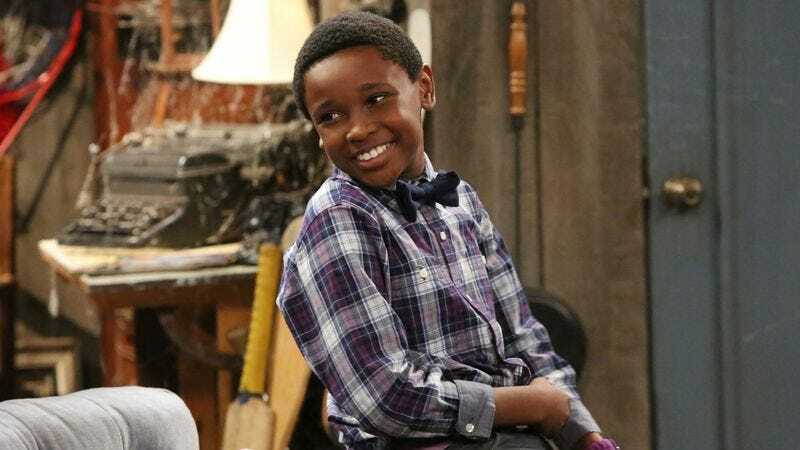 Hathaways fits snugly into Nickelodeon’s Saturday night lineup—preceded by the newly minted iCarly-spinoff Sam And Cat and followed by rerun episodes of alien-comes-to-high-school comedy Marvin Marvin. Right now Nickelodeon’s major ratings haul is with both Sam And Cat and the perennial favorite SpongeBob SquarePants, but the network could sorely use another live-action comedy to garner the obsessive following of the tween market. Despite Nickelodeon’s demonstrated skill with children’s programming, live-action comedy has been their major weakness in the last five years—iCarly was their last mega-hit, and that show aired its final episode over six months ago. In part this is because they’ve fractured into various sub-networks—Teennick absorbs most of the network’s successful live-action shows oriented to older audiences, and with Nicktoons and Nick Jr. standing ready to take on animated and young-children’s programming, Nickelodeon appears to be at loose ends. (A quick look at the programming schedule for today reveals multiple-hour rerun blocks of both SpongeBob and The Fairly OddParents.) So The Haunted Hathaways is part of a surge of comedies Nickelodeon is churning out this year—in addition to Sam And Cat and Wendell & Vinnie, the network is supposed to debut The Thundermans, another live-action comedy about a superhero family, sometime in 2013. But largely this is because Nickelodeon's major competitor in this demographic is the Disney Channel, and that network has been doing a very good job of finding and targeting its audience—creating teen stars and pop careers along the way. Given this information it's not terribly surprising to find that The Haunted Hathaways feels like a budget makeover of the Disney series The Wizards Of Waverly Place, a Selena Gomez vehicle that had a substantial following of its own. Kids aren't dumb, and most will be able to see the copycat move. But the field is open enough that The Haunted Hathaways looks poised perform the way the network hopes it will—though it lacks a truly charismatic female lead like Gomez, which could be a problem. The writing on the show is light and snappy, easily moving through humor that makes fun of the adults and children alike. It’s still a show for kids—and as such is full of physical, splashy gags, ones that make liberal use of fart jokes and the invisibility of said ghosts to outsiders. The plot arcs are broadly written around teenage sitcom tropes—the middle-school science fair and the disastrous sleepover are in the first three episodes alone. But the characters are sharply drawn, and for the most part, well-acted, too, equipped with clever one-liners and reaction shots that give them appealing personality. The girls’ mother Michele runs a bakery and is humorously out of touch with her kids’ lives; Chico Benymon as ghost-father Ray plays the saxophone and praises his kids for getting up to tricks. Daughter Frankie and the two ghost-sons Miles and Louie are extraordinarily well played—Frankie astonishes the ghost family by being more amused than afraid of their spooky antics, and Miles and Louie carry their own personal dysfunctions for being weird, isolated ghost-kids. All three manage to be very funny in their own unique ways, which is an accomplishment in an otherwise formulaic comedy. The only mediocre performance is by older sister Taylor, acted by Amber Montana. Montana is a bit wooden, a little uncomfortable in her role, in which she seems painfully aware of the camera at all times. But where Montana does not measure up in realistic expression, she makes up for in relatable, tween self-consciousness—and it’s a role that doesn’t require much more than that. The emotional resonance of The Haunted Hathaways lies largely on her shoulders—she’s the plot’s agent of change, the character most driven into fitting into society’s norms, the most invested in the world outside of the haunted house. Given all this, Montana’s naivete could be its own strength, and it’s likely she’ll become more comfortable with the material as it goes on. The Haunted Hathaways could have done without the multi-camera format—the show’s quirkiness and clever characters deserve the attention of a single-camera format, which would give everyone on the show the space to breathe. But as it is, it’s a fun piece of work, a show that should be quite easy to watch for anyone in the age bracket. The show has flaws, but in the episodes pre-released to critics, the humor of the situation is well-balanced by the occasional glimpse into more textured personal lives, and it seems like the show could grow up to be a strong addition to Nickelodeon’s lineup. It’s worth noting that the show has an interesting racial and gender breakdown—the ghosts are all black men, and the Hathaways are all white women. This may not mean anything, but it seems irresponsible to not note it. Considering New Orleans’ heritage, it’s a good choice to include a family of black characters. It’ll be interesting to see how the show continues to work with the demographics of the city. It’s kind of like the Addams Family meets The Brady Bunch meets Diff'rent Strokes, for kids. Miles, the lonely ghost who wants friends, is so tragic it’s kind of heartbreaking. Miles, I will be your friend.